This amazing video was shot by one of our photographers, Alyssa Hopkins, and captures the December 19th visit of The 501st Legion to All Childrens Hospital, the largest visit there I’ve organized. Almost thirty costumed members, one droid, two news stations and two wagons of donated toys, with the capper being a trip to the helipad on top of the building. 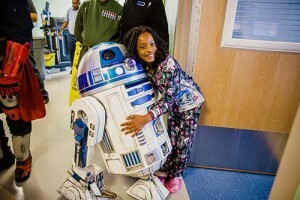 Since the children who are fighting illness couldn’t go see Star Wars on opening weekend, we brought Star Wars to them. I hope you enjoy watching it as much as we enjoyed participating in it.